Microsoft provides genuine users who purchase license and product key online to download the setup package directly from its content delivery partner’s digitalrivercontent.net server. 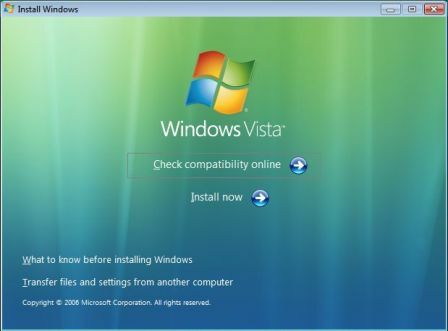 In fact, anybody can use the leaked direct download links to download the Windows Vista installer directly from Microsoft to ensure the copy is clean, unmodified and untampered with. The downloaded packages are in .WIM format and extension, which can be made into a bootable ISO DVD image of Windows Vista setup disc. Now, this guide will make use of vLite to build the ISO image from WIM archive files. 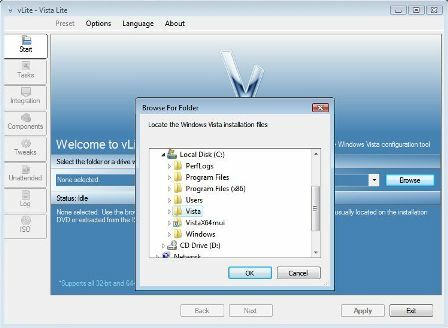 vLite is a freeware application to customize Windows Vista installation to create customized Windows Vista DVD media before actually installing Windows Vista. With vLite, it’s possible to further customize the final DVD ISO image to user’s likings. In this guide, the installation process will skip asking for product key (so that trial version for 30 days evaluation is installed) and bypass attempt to automatic activation. 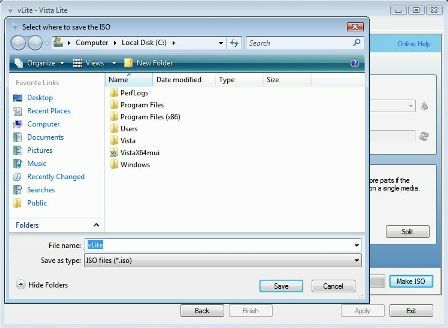 As earlier guide has shown instructions for x86 Vista, this guide will take this opportunity to provide step-by-step instructions with illustration to make bootable ISO image for Windows Vista x64 edition instead. The only difference between creating ISO DVD image for 32-bit and 64-bit Windows Vista is that there is no need to download and deal with etfsboot.com when preparing files for 32-bit Windows Vista disc. Download the 3 x64 Vista setup files namely install.wim, boot.wim and X13-49121.exe. Download and install vLite from www.vlite.net (now NTLite). (Not required for 32-bit Windows Vista) Download the etfsboot.com (no longer available). etfsboot.com is the boot image necessary to create bootable DVD. Copy install.wim, boot.wim and X13-49121.exe to system root drive (i.e. C:\ folder). Double click and run the X13-49121.exe. A “Windows Vista Setup Preparation” dialog box will appear and start extracting 64-bit Windows Vista setup files. Once extraction done, a Windows Vista folder (i.e. C:\Vista) will be created and population with installation files, and setup will automatically launch. Click on “X” button on the top right corner to close and exit from the setup. If you’re running the X13-49121.exe on 32-bit Windows system, an error saying “Cannot extract Windows Vista Setup to your hard drive. Please ensure that you can create files and folders in the same folder where VistaSetupPrep.exe was downloaded.” will appear. In this case, click “OK” and ignore the error. (Not required for 32-bit Windows Vista) Copy etfsboot.com to the boot folder inside the “Vista” folder, i.e. C:\Vista\boot directory. In “Start” tab, click Browse button, select the Vista folder, i.e. C:\Vista. 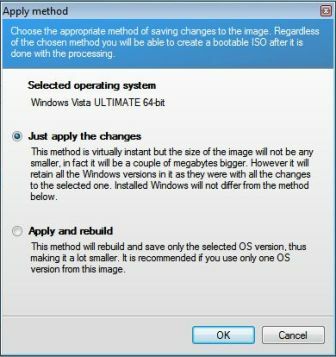 In the Images dialog box that pops up, select the edition of Windows Vista operating system to configure, i.e. Windows Vista ULTIMATE, and then click “OK”. Other editions of x64 Windows Vista included in the 3 downloaded files are Windows Vista Home Basic, Windows Vista Home Premium, Windows Vista Business, Windows Vista Ultimate, Windows Vista Home Basic N and Windows Vista Business N.
Tick the check box for Unattended Setup, Bootable ISO and Enable before apply options. 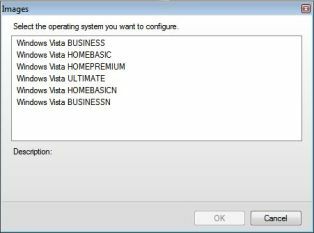 Note: If you don’t want to customize to install Windows Vista silently, unselect Unattended Setup, and you will skip the next 2 steps. Tick the check box for Skip product key and Skip automatic activation options. If you want to have a choice of Windows Vista edition to install during setup, uncheck Select this version on install. Click “Apply” button, and then select appropriate “Apply Method”. Both Just apply the changes or Apply and rebuild is fine, the if you choose the later you won’t be able to select other editions of Windows Vista during setup. Wait for processing to complete. Click Make ISO button, and select a location to save the new ISO image file, i.e. on C:\ folder. Click “Finish” or “Exit” button. Burn the ISO to a DVD with any image writing software such as Nero or Roxio. The Windows Vista 64-bit DVD can be used to boot up a computer and start fresh installation of x64 Windows Vista.